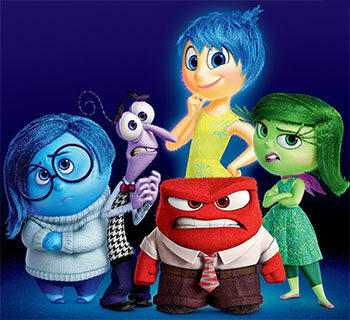 Inside Out is arguably Pixar's finest film, says Raja Sen. I always found that a dashed impossible question. Purple leaps to mind because of how cool and wizardly it is; I’m partial to pretty girls in Yellow; Blue is the colour of ink and jazz and skies; and, like Ferraris, I look best in Scarlet. But then Holly Golightly made us realise how mean Red can be. There truly can be no one favourite colour, merely one best-suited for a moment. It’s as pointless as using one singular feeling to label a moment, a memory, a thought. At every given time, we’re a jumbled up mess, our feelings and emotions questioning and contradicting and second-guessing each other as they jostle for attention -- and with Inside Out, Pixar’s latest and arguably finest film, we get a glimpse into what goes on behind the scenes. The film takes place inside the head of a little girl, Riley, an ice-hockey-loving 11-year-old moving with her parents from Minnesota to San Francisco. But woe is she, for San Francisco puts broccoli on their pizza. Disgust, a green glitter-haired sprite inside Riley’s head is appalled. Alongside her, astride a control bridge, are the red and inflammable Anger, the nerdy purple Fear, the despondent blue Sadness and -- leading the pack -- the giddily ebullient Joy, bright yellow and impossibly determined to keep Riley happy as can be. This is a startlingly new landscape, even for the imagineers over at Pixar, and there is tremendous fun in watching these five emotions take turns at making Riley live and feel and react. Joy -- voiced by the irrepressibly buoyant Amy Poehler -- is an obvious favourite, not least because she looks a bit like Tinkerbell and because her motive is wanting Riley to be happy. So happy, in fact, that Joy chalks out a little circle and asks Sadness to stay within the lines. If you’re astonished by such an elegantly simple metaphor about Repression in an animated film, buckle up: this film goes deep. Significantly, psychologically, educatively deep. Director Pete Docter has done something absolutely stunning here. Inside Out is certainly a candied Pixar adventure-comedy, wickedly witty and polished till it shines, and yet there is tremendous insight as the film intuitively and evocatingly zigzags through a brain. There are, for example, racks upon racks of bright coloured memories -- like a giant gallery of M&Ms -- of which some are fading and being forgotten, because of misuse and because they aren’t accessed often enough, but where some peculiar ones. A theme-tune to a gum commercial seen in childhood, say -- are frequently tossed into the foreground of the brain, just for the heck of it, where it will persistently rattle around all day. Choo-chooing somewhere in the distance is a locomotive, a literal Train Of Thought. And seemingly holding the structure together, formed out of Riley’s core memories, are her Islands Of Personality, theme parks inside her head for the things most important to her: Family, Hockey, Friendship, Honesty and Goofball -- the last working well when Riley needs to make monkey-sounds with her parents. Things, naturally, go wrong somewhere near the control panel, and while much can be said about the grand adventure taking place inside Riley’s head -- but why give it away? -- the most glorious thing about Inside Out is that it meanders away from obvious storytelling and gives us room to think about ourselves. I, for example, caught myself wondering what islands I’d have inside my head. Riley, voiced by Kaitlyn Dias, is a perfectly nice girl, but the fun characters all lie within her. Joy is almost unbearably bouncy, and Poehler -- with her Leslie Knope infallibility in place -- nails the crucial balance; Mindy Kaling is sneeringly spot-on as Disgust; Richard Kind is wonderful as Bing Bong, an imaginary friend who cries candy and can “blow a mean nose”; and the film’s most nuanced performance comes from Phyllis Smith, making Sadness so darned irresistible. Inside Out’s crowning achievement may be the parity it achieves, the way it illustrates how one emotion isn’t better than another, that each is important and makes a difference. Why, sometimes you need to heat Anger up just to use it as a weapon. A staggeringly original film, Inside Out is a cinematic miracle. There has quite frankly never been anything like it before, and it is an essential film for lovers of the movies, children, parents and inner-children everywhere. It is insightful, intoxicating and incredible, and when I was done with it, scrubbed and sobbed and sated, I felt I’d been scribbled on by Pixar crayons. The detailing is exquisite -- Joy, using a french fry as a pole-vault licks her salty fingers right after -- Michael Giacchino’s music is fantastic, and there is something in the film to speak to each of us. And what critic dare rebuke a film he’d pick over a dream?